The Cuisinart CGS-134BL is a 3 piece grilling tool set with grill glove which keeps hand cool while the grilling gets hot. This stylish 18 inch set comes with the three vital tools for grilling food perfectly. The durable tools all boast comfortable heat resistant rubberized grips that are easy to hold even while wearing the grill glove to protect hand from the grill flames. 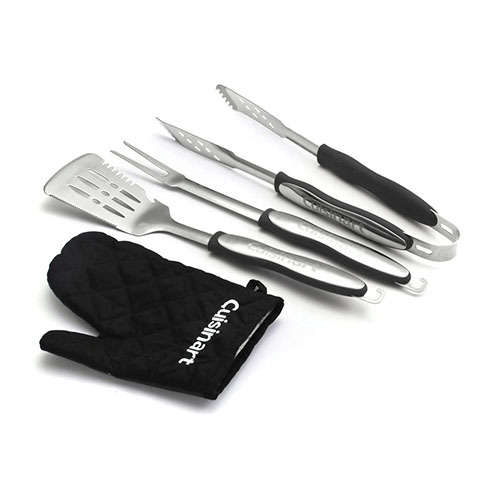 The Cuisinart 3-Piece Grilling Tool Set with Grill Glove has many exciting features for users of all types. 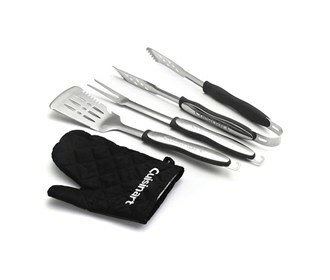 The Cuisinart 3-Piece Grilling Tool Set with Grill Glove is sold as a Brand New Unopened Item.